The number of people who show their dedication to creating the perfect landscape design by hiring maintenance services increases every year. Everyone enjoys an open space that connects various outdoor areas and creates a natural and inviting flow. With alfresco living, every meal is a special experience because of the casual but festive atmosphere of outdoor cooking, dining and lounging. Outdoor kitchens, pizza ovens, grills and fire pits are a necessity for creating an outdoor area suitable for this purpose. These features make entertaining more enjoyable for the homeowners and add more surface area to the floor plan of your home, as they convert outdoor space into functional outdoor rooms. More and more homeowners are embracing the natural look with their hardscaping materials. Natural stone patios and walkways, as well as vertical features such as outdoor fireplaces, fire pits and wall systems, are ever popular. Popular natural stone used in hardscaping includes bluestone, limestone, sandstone, flagstone, and granite. More and more homeowners are also opting for locally sourced materials and aiming for a more authentic, sustainable backyard. There is also an emphasis being placed on craftsmanship because of its power to transform the backyard. Wood and stone are ideal materials for handcrafted details and spectacular designs. 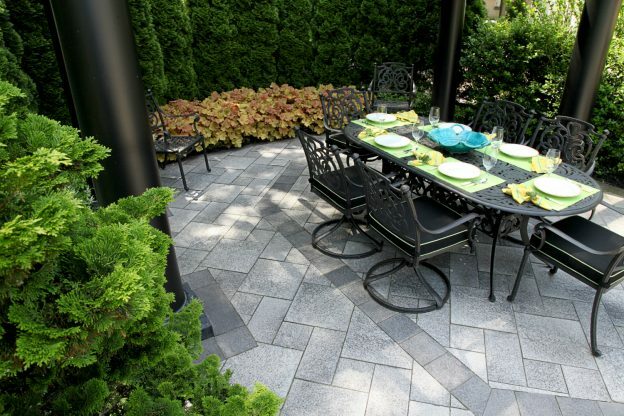 Small backyards can easily be transformed into attractive and functional outdoor spaces. With small yards, less is more. Incorporating features that offer multiple functions is a creative way to make better use of the space while adding bold visual elements. Small yards are also perfect for stimulating the senses. By dressing the landscape with strongly-scented, therapeutic flowers, pops of color can be added while creating a rich ambience. Pergolas and gazebos not only offer shade and shelter, they are also stunning additions to the aesthetics of an outdoor space. These structures create a sense of intimacy and can serve as the centerpiece of an outdoor area. If decorated with vines and climbing plants, pergolas can help to introduce color, fragrance, and texture – perfect for a backyard getaway. Regardless of whether you include a mini waterfall, a small pond, or a cool fountain, water features add a fresh touch to the outdoor space. The soothing sound of water can contribute to peaceful afternoons outdoors while the movement introduced by water features can contribute to a beautiful landscape. Water features can be further enhanced with the addition of lighting to highlight the feature and reflect off it’s rippling surface. 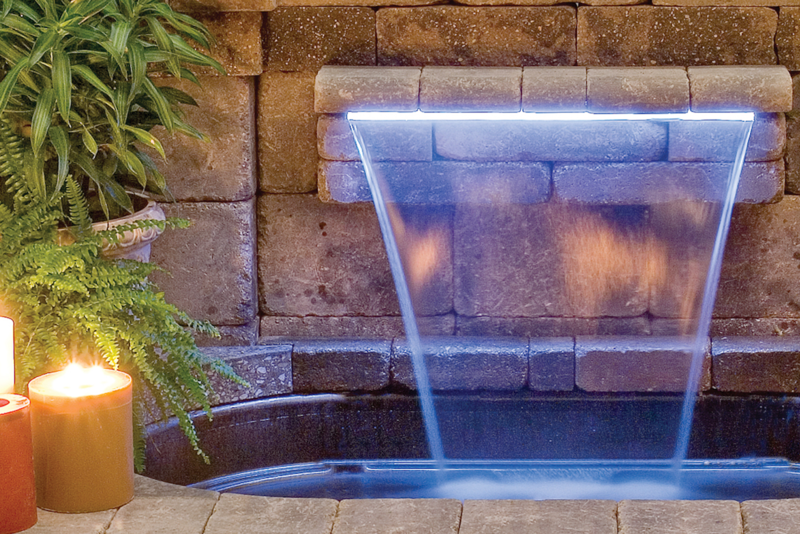 Using lighting in conjunction with water features also provides safety benefits and reduces the risk of guests accidentally stepping into your pond. This entry was posted in Design & Construction and tagged Landscape Design, Landscape Design Themes, Outdoor Dining, Pergola, Water Features on March 20, 2018 by 12850420. In this world of instant communication, a space to unplug and unwind is essential for peace of mind and privacy. It’s not that we dislike the neighbors; it’s that we want to have that first cup of coffee on the patio with a bed head and mismatched pajamas. There are fences, of course, high enough and solid enough to ensure privacy, but often aren’t decorative or discrete enough to maintain a soothing backyard ambience. Luckily, there are other options. Let’s take a look at how you can ensure your privacy while contributing to the overall décor of your backyard. Now here’s a lush fence that remains soft and thick all year long. The Thuja Green Giant grows fast, three to five feet a year, and because it grows so tall and slim, it takes up little very little space. They look like those elegant sculpted trees in a French Renaissance garden and maintain their shape well, even without pruning. The Thuja can be planted in rows to create a privacy shield and will also help with heating bills by protecting your home from the wind. Quaking Aspens lined up along the edge of your property are hard to top in terms of natural beauty and elegance. Their trunks are smooth and pale with black markings. Their green leaves are glossy, and in autumn turn into the most spectacular shades of gold for a stunning visual effect. Quaking Aspens adapt well to any climate and grow from the frigid Arctic Circle to the burning heat of Sierra Madre in Mexico. A slightly faster grower than the Thuja, Quaking Aspens shoot up some four to six feet a year. If planted in groups of four or more, the Quaking Aspen can provide the ambience of a backyard forest and the kind of privacy that goes with it. The Quaking Aspen is one of the few trees that can be identified by their sound. The leaves are roughly square shaped and flutter and tinkle, like a soft wind chime. Bamboo is one of the fastest growing plants on the face of the earth. Plant it along your property line, at selected spaces around your yard or around your patio, and you will have a graceful, swaying, Zen-like privacy fence. Bamboo can get out of control though, so may require containers to restrain its growth. Pergolas and trellises are attractive structure that can be used to create an area of privacy in your yard. They diminish the ability of visual interlopers to look in without completely blocking your view or stopping that lovely breeze from coming through. You can enclose as much or as little of your yard as you like in whatever arrangement that serves your purposes. Ivy and/or flowering vines can be added to further ensure a secluded retreat. Screens are beautiful outdoor privacy options that are available in a wide range of materials, including bamboo, wicker, wood, resin, and vinyl. Many of them fold out to allow for interesting arrangements. Screens may also be hung from outdoor structures. Place them how, when and where you need privacy. This entry was posted in Design & Construction and tagged Landscape Design, Pergola, Plantings, Privacy on April 20, 2017 by 12850420.